Aquaria (D) UT ACTION LIONFISH BLUE - Rick's Pet Stores Inc. 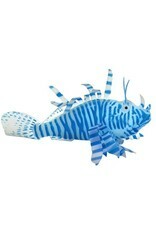 The Action Lionfish is a dynamic decoration that adds a splash of fun to any aquarium. 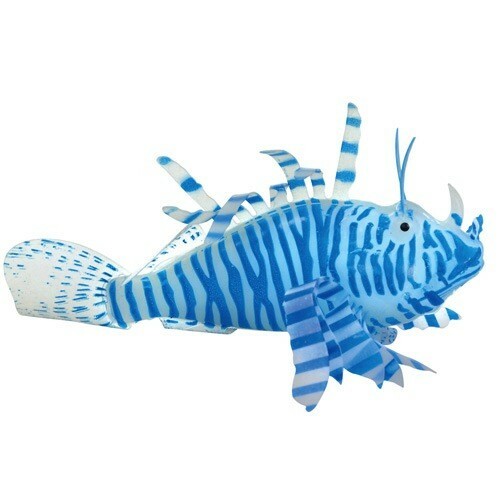 Designed to mimic the fluid movements of a real Lionfish, this eye-catching ornament uses the natural current in your aquarium to glide through the water. It features brilliant coloration to complement your aquascape, and offers life-like action to captivate passersby. The Action Lionfish secures to the bottom of your aquarium with an included suction cup and "invisible" tether, and features an integrated buoyancy bladder to remain afloat. Simply anchor the suction cup in the desired position, and watch the Action Lionfish come to life. Use with actinic or UV light to add a stunning glow effect to this hypnotic dance!5" x 1.5" x 3.5"